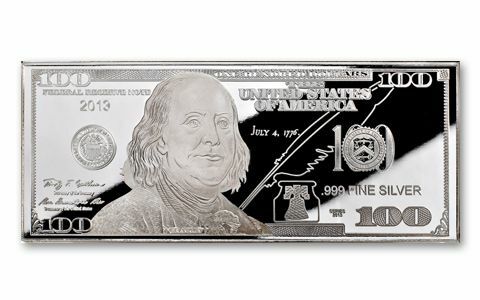 Limited Mintage Striking of an Extraordinary Silver Proof-the Newest United States $100 Bill Struck in Pure Silver Bullion. This extraordinary piece of pure silver bullion has a surface area that exceeds 15 square inches and it contains one Troy ounce of pure silver bullion! 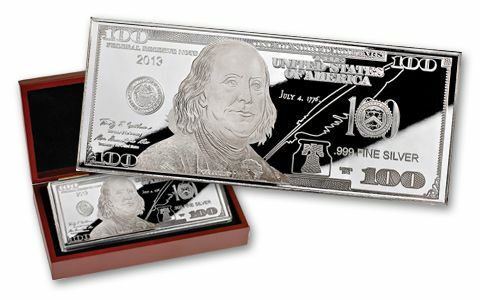 The historic 2013 $100 Silver Proof is an exquisite adaptation of the United States Treasury's newly-designed $100 Federal Reserve Note-only the second new $100 bill design in 70 years. It is a true artistic masterpiece that will always be treasured. Best of all, this stunning Silver Proof is even more beautiful than the original, because it's struck in precious silver bullion! It is a landmark in proof minting, combining unprecedented weight with extraordinary dimension. The specifications for this colossal medallic proof are unparalleled. 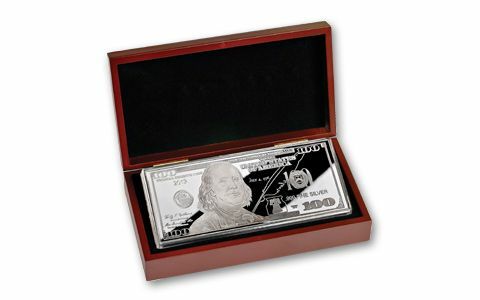 Striking is limited to only 9999 One Troy Ounce Silver Proofs for the year 2013. Once the edition is sold out, no more 2013 silver proofs can ever be struck. Call Today to Order Your $100 Silver Proof!